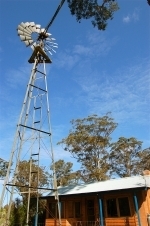 The Windmill Cottage offers an outstanding nature tourism experience . Unwind in a peaceful honeymoon cottage overlooking a tranquil pond with abundant wildlife and existing windmill from past times . View a wonderful variety of bird life in a natural environment from the privacy of your own cottage and sun deck. The self catering one bedroom couples cottage is stylishly designed with modern furnishings and colours to give you charming yet contemporary jervis bay getaway accommodation. The entrance to your own luxury spa cottage ensures you full privacy and your own pond/water feature to enjoy. Relax in the cosy space , seclusion and fresh country air at a Jervis Bay landmark property , the perfect couples getaway . Join us and forget those deadlines that we live with in every day life .